A two-year study into used electrical and electronic equipment (UEEE) sent to Nigeria, mostly from European ports, has revealed a continuing "severe problem" of non-compliance with international and national rules governing such shipments. Limited functionality testing revealed that, of the UEEE sent to Nigeria from other countries in 2015 and 2016 — assessed at around 60,000 metric tonnes in both years– at least 15,400 tonnes didn't work. This annual volume of imported e-waste, prohibited under both the Basel Convention and the EU's Waste Shipment Directive, is enough to fill a 10 kilometre line of full-loaded 36-tonne 18-wheel trucks. The study also revealed that almost 70% — 41,500 tonnes — of the UEEE reaching Lagos each year arrived inside vehicles destined for Nigeria's second hand auto market, an import route never before thoroughly assessed. Another 18,300 tonnes arrived in shipping containers. By weight, LCD-TVs and flat panel monitors made up the largest category (18%) of imported UEEE. Over half (55%) of these were found to be non-functioning e-waste. The second largest category — CRT-TVs and CRT-monitors (14%) –are formally banned from importation. Of the UEEE imported inside "roll-on / roll-off" (Ro-Ro) used vehicles (so called because they are driven onto and off the ships rather than being transported in containers) the vast majority (98%) came from EU member states. The rest came from the USA. Another 18,300 tonnes were imported in containers, originating predominantly from ports in the EU (29%), China (24%) and the USA (20%). Overall, around 77% of the assessed UEEE imports originated from ports in the EU, mainly from Germany and the United Kingdom (around 20% each), followed by Belgium, The Netherlands, Spain and Ireland (between 9% and 6%). China and the USA each accounted for around 7% of the total imports. The report concludes the first ever, long-term (16 month) study of containers and vehicles in a known destination country for UEEE and WEEE, including a review of import documents. It was conducted in two ports in Lagos under the "Person in the Port (PiP)" project implemented by the Basel Convention Coordination Centre for the Africa Region (BCCC-Africa) and the United Nations University (UNU), as part of the Solving the E-waste Problem (Step) Initiative. "The importation of UEEE in vehicles is economical for the shippers because it fills valuable space during shipments," says Prof. Percy Onianwa, Director of BCCC-Africa. 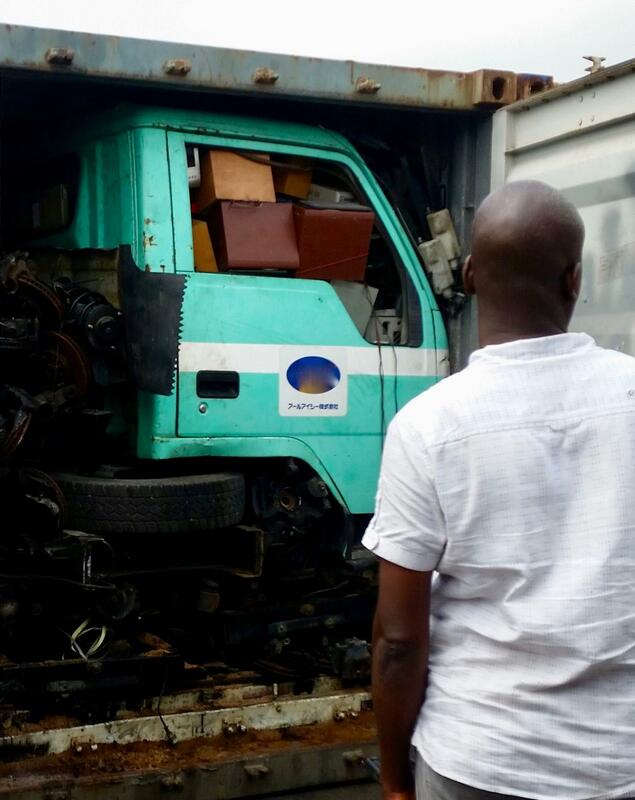 "However, because in particular the contents in RoRo-vehicles' are not yet on the radar for such tests, this practice serves to avoid inspections and functionality tests on UEEE by the regulatory agency, resulting in many tonnes of e-waste arriving illegally into Nigeria." "In the best case scenario, our study shows, at least 15,600 metric tonnes of non-functional UEEE is imported into Nigeria each year. UEEE containing hazardous substances – e.g. mercury and (H)CFCs — are among the products with the highest non-functionality rates and the highest import volumes." "Almost all of the importers or their agents are Nigerians, of which 80% are located within the Lagos metropolis," adds co-author Olusegun Odeyingbo of UNU. "The imports of UEEE can generate considerable profits, especially if they can be sold primarily for re-use." "The overall profits depend on the quality and the brand of the UEEE, and on the exchange rate of the Nigerian currency, the Naira, in particular with the US dollar and the Euro." "The main business potential of UEEE is re-use, as this enables highest sales value," he notes. "Imports of e-waste return only marginal profits based on material value alone making it more attractive to import functional or repairable UEEE. Where UEEE is broken, repair and spare parts harvesting offer higher value returns before recycling for material value." According to the report: "The enforcement of regulations in the countries of export, mainly in the EU and in Nigeria, need to be strengthened, and closer cooperation amongst local regulatory and enforcement agencies is highly advisable." Says Ruediger Kuehr, Director of UNU's SCYCLE Programme in charge of e-waste: "Next steps should involve making certificates of functionality testing an obligatory part of the requirements for transporting used electronic and electrical equipment, along with standard functionality tests, accepted by both exporting and importing countries, for each type of UEEE. Furthermore, projects of this type are needed in other parts of the world to better understand the magnitude and dynamics of these imports and exports." an estimated 5,900 tonnes of LCD-TVs that may contain mercury in cold cathode fluorescent lamps (CCFL) backlights (which requires special treatment). BCCC-Africa is one of the fourteen regional centres established globally under the provisions of the Basel Convention to support parties to the convention in meeting their obligations to implement the Convention. The centres are mandated to conduct capacity building trainings, information dissemination, technology transfer and research. BCCC-Africa has been very actively involved in studying the e-waste problem in parts of Africa. The Solving the E-waste Problem (Step) Initiative emerged in 2004 as an independent multi-stakeholder platform for designing strategies that address all dimensions of electronics in an increasingly digitized world. The Step mission is to apply an integrated, science-rooted approach to create salient solutions to global e-waste challenges along the entire electronic life cycle.